Most of the heavy lifting is done by .net libraries. These can be tested independently from 3dsMax. 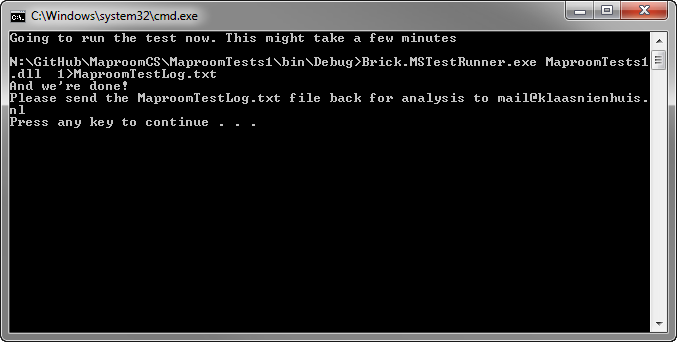 These tests operate with a commandline tool and generate a text-file with the test results. After the tests have run, which might take a minute or two, please send this text-file to mail@klaasnienhuis.nl. Download the testfiles here dotnet test files. Get the latest zip-file labeled with dotnet in the filename. The tests (should) also create some images in your user folders. They should be about here: C:\Users\[username]\Documents\3dsMax\MaproomTest. Please zip that entire folder and send it over too.